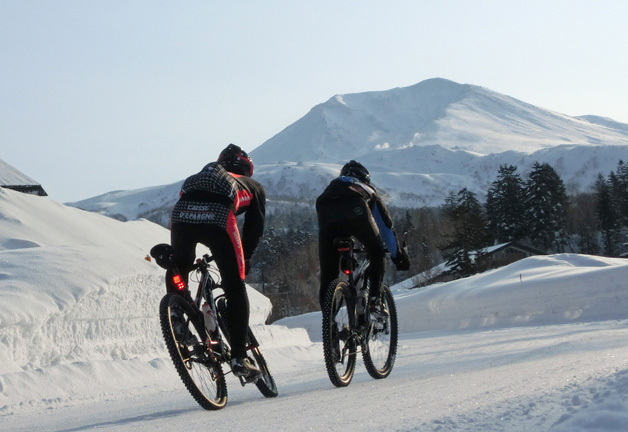 Our new website: Snow Biking in Japan. We continue our reports there. A temperature of 20 degrees Celsius below zero, visibility is limited to 10m because of a strong snowfall, roads are covered with hard ice, but it's not an excuse for us not to ride bikes every day. The majority of cyclists might not know the existence of people who ride bikes on snow more than 1000km a month, who go over mountains in blizzard and who ride at 70km/h on ice. On this site, we are going to introduce such people and give you some empirical advice on riding in the snow. We expand our knowledge of snow cycling to around the world! In addition, this site presents our training scenes with a lot of pictures in the section Training reports. Our training is often held in Niseko, at the Tokachidake Onsen (Tokachidake Hot Springs), the Asahidake Onsen (Asahidake Hot Springs) and so on. We live in the west side of the Hokkaido Island in Japan. This part of the island is famous for an enormous amount of snow. Here, you have one of the best snows in the world as the temperature is low enough and the quantity of snow is huge. In summer, we are cyclists of road racing. However, it is impossible to ride road bikes during the winter as the roads are completely snow covered in this region. So in winter, we train on snow with road racing bikes for snow or MTBs (mountain bikes) equipped with studded tires. There are cyclists who criticise that training with MTBs is not so efficient and they say it would be better to train on a trainer. They sometimes advise us to move to a region where it doesn't snow in order to be able to train every season. They think the snow is our disadvantage. However, we think otherwise. We can train much better and effectively on snow than asphalt if you have suitable equipment. If you train suitably, you will turn this disadvantage into advantage. Studded tires are very heavy. So training with heavy studded tires are really hard. Therefore, we think training on snow with studded tires is highly effective and our advantage. We consider the snow is our most important training partner. This site was created by Cairn and K (Tesseract) in January 2005. And Dr.K has been helping the administration of this site since the beginning. First of all, I thank you for visiting this web site. I hope you will enjoy it. As English is not my mother tongue, sometimes you'll find mistakes or incomprehensible texts. I will be grateful if you let me know my mistakes and correct expressions.